SAN ANTONIO (Texas) • The Golden State Warriors have made a habit of conceding the San Antonio Spurs big leads and then coming back strongly to make things happen. So when the Warriors trailed by 19 points nine minutes into the first quarter on Thursday, there was no sense of panic from the National Basketball Association (NBA) champions. They just upped their defensive intensity and shot their way back into the game. 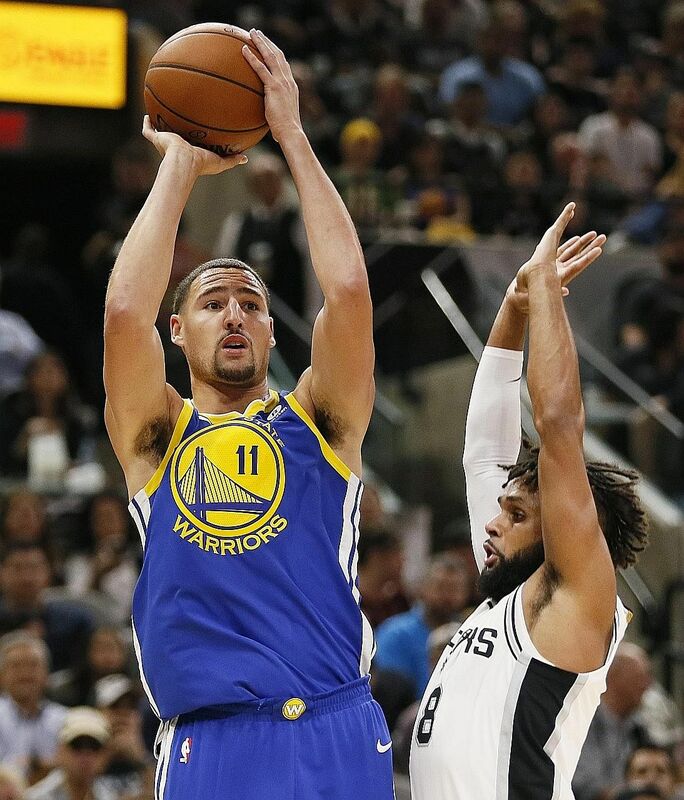 Klay Thompson had 27 points and was five of eight from three-point range, as Golden State defeated San Antonio 112-92 at the AT&T Centre in the first match-up of the season between last year's Western Conference finalists. The Warriors outscored the Spurs 34-23 in the third quarter to erase a five-point half-time deficit and take control after a shaky beginning at both ends of the floor. "We might as well start every game here down 20 - other than the play-offs last year, that's four or five straight games where that's happened," Golden State coach Steve Kerr said. "They have an edge on us with their size and strength and we weren't ready to battle early, and that's why we fell behind. "Once we started competing and running and pushing the ball, we got into a good groove." Thompson scored seven of the Warriors' first nine points of the fourth quarter as Golden State (6-3) forged a 12-4 run to assume a 96-82 lead with 6min 41sec to play. They held on without much pressure from San Antonio. 4 Defeats in a row for San Antonio, the first time they have landed in such a rut since February 2015. They started this season 4-0. San Antonio coach Gregg Popovich was not around for the end of the game after being ejected with back-to-back technical fouls with 4min 47sec left. Courtside microphones picked up Popovich swearing at the referee before he was given his marching orders. The stormy encounter saw Kerr lose his cool on the sidelines earlier. He was assessed a technical foul after vehemently arguing a non-foul call with 3min 45sec to play in the first quarter. Kevin Durant added 24 points after missing his first eight shots. Stephen Curry scored 21 and Draymond Green poured in 16 on seven-of-eight shooting for the Warriors. LaMarcus Aldridge led the Spurs (4-4) with 24 points, the seventh time in eight games he has paced San Antonio. Kyle Anderson added 16 points and Pau Gasol had 11. The defeat marked the first time since February 2015 that the Spurs have lost four games in a row. The Spurs played again without star forward Kawhi Leonard and guard Tony Parker, both of whom are recovering from quad injuries. "Whether you win or lose, it's a game of mistakes," Popovich said. "We lost against the best team in the world and there are a lot of things we need to improve on."